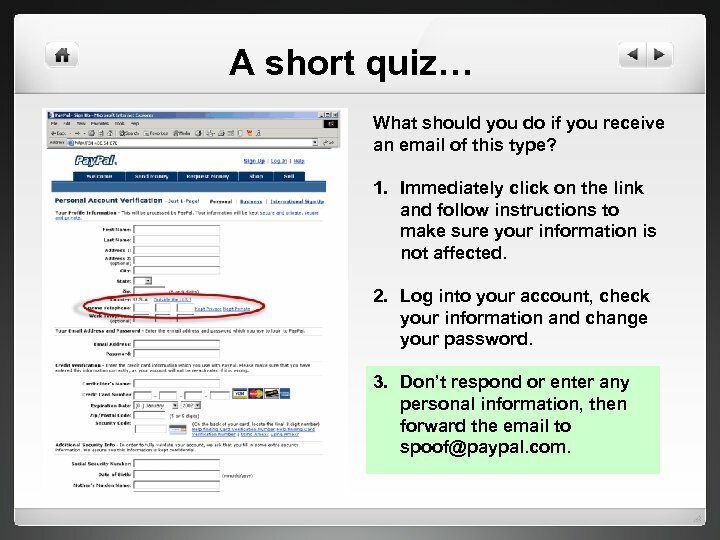 A short quiz… What should you do if you receive an email of this type? 1. Immediately click on the link and follow instructions to make sure your information is not affected. 2. Log into your account, check your information and change your password. 3. 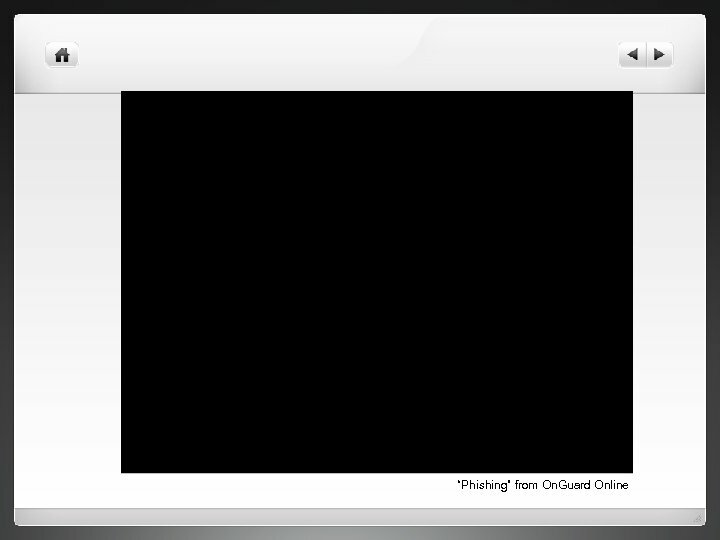 Don’t respond or enter any personal information, then forward the email to [email protected] com. 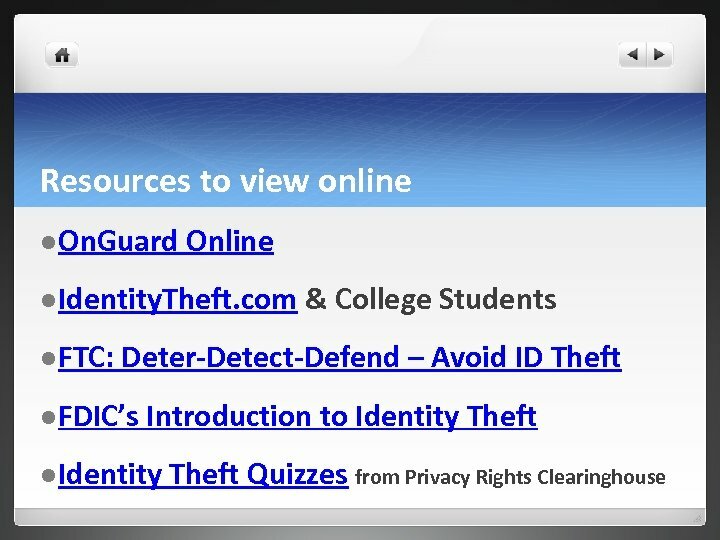 Protect your personal information l Identity theft risk can be minimized when online by not giving out personal information. 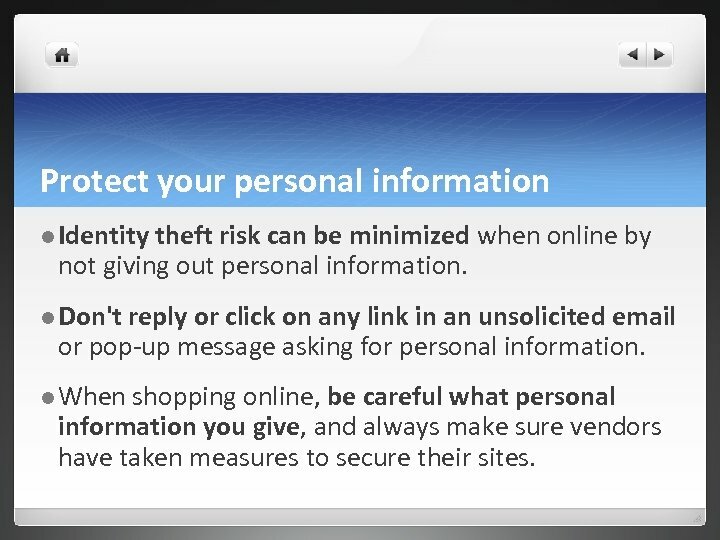 l Don't reply or click on any link in an unsolicited email or pop-up message asking for personal information. l When shopping online, be careful what personal information you give, and always make sure vendors have taken measures to secure their sites. 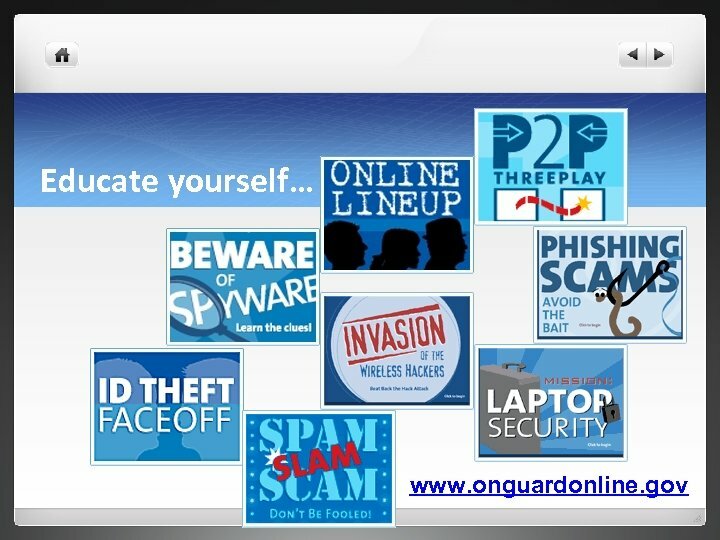 Know who you are dealing with online l Phishing. 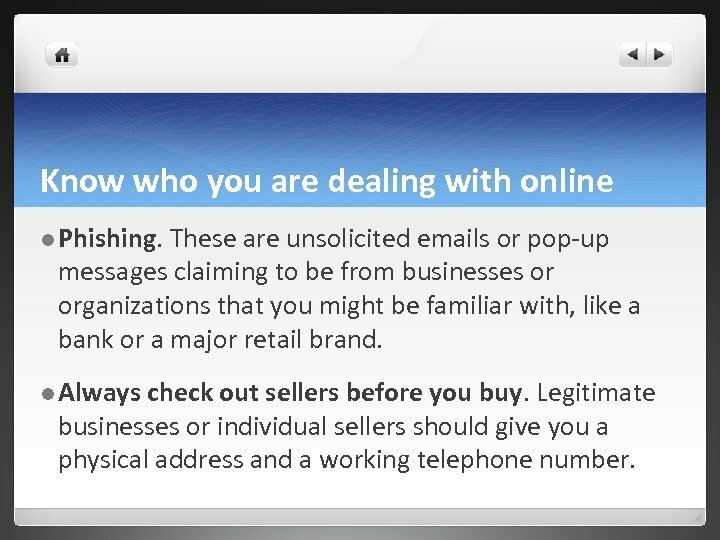 These are unsolicited emails or pop-up messages claiming to be from businesses or organizations that you might be familiar with, like a bank or a major retail brand. l Always check out sellers before you buy. Legitimate businesses or individual sellers should give you a physical address and a working telephone number. 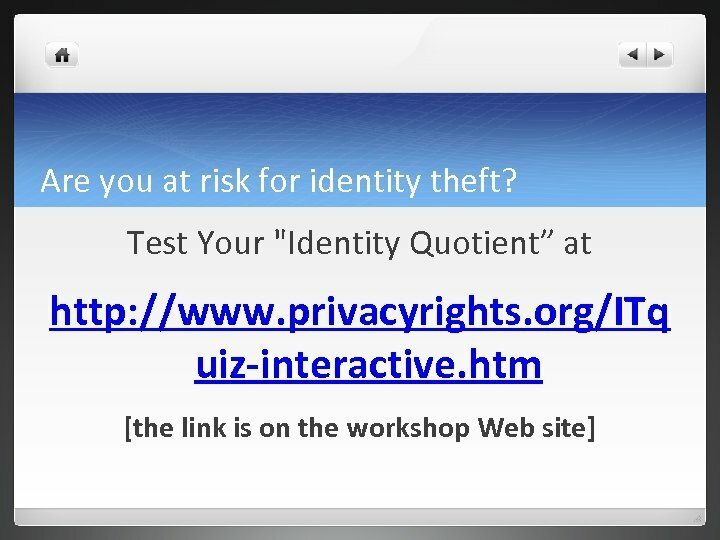 Know who you are dealing with online l Free Software and File Sharing. Online file-sharing can give people access to a wealth of information. l Spyware comes with many free downloads. This is software that is installed without your knowledge that adversely affects your computer, and may access your personal information. How did you score? 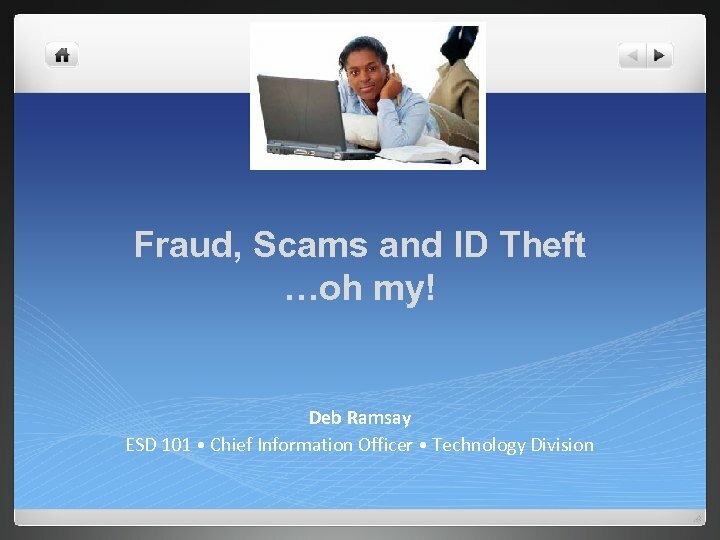 l 100 + points - Recent surveys indicate that 7 -10 million people were victims of ID theft last year. You are at high risk. We recommend you purchase a paper shredder, become more security-aware in document handling, and start to question why people need your personal data. l 50 -99 points - Your odds of being victimized are about average. l 0 -49 points – Congratulations! 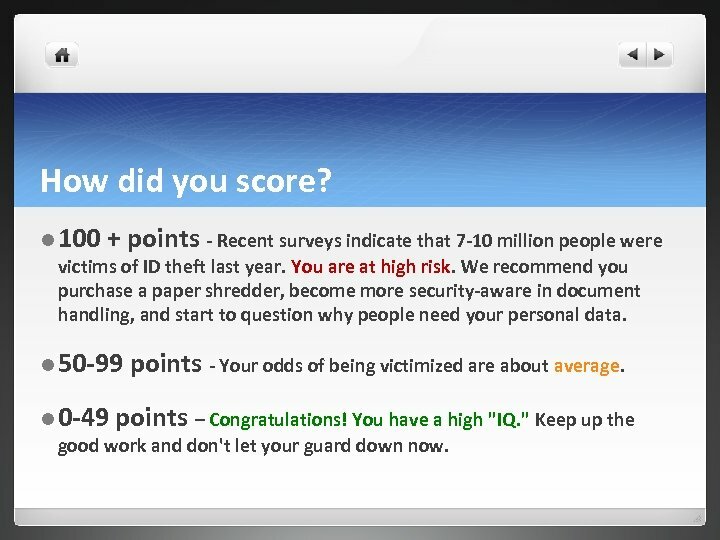 You have a high "IQ. " Keep up the good work and don't let your guard down now. Protect your computer l Anti-Virus Software helps protect your computer from viruses that destroy data, cause crashes or even steal your personal information. l Anti-Spyware Software helps protect your computer from malicious spyware that monitors your online activities and collects personal information while you surf the web. l A firewall helps keep hackers from accessing your computer to gather information without your permission. But nothing provides 100% protection! 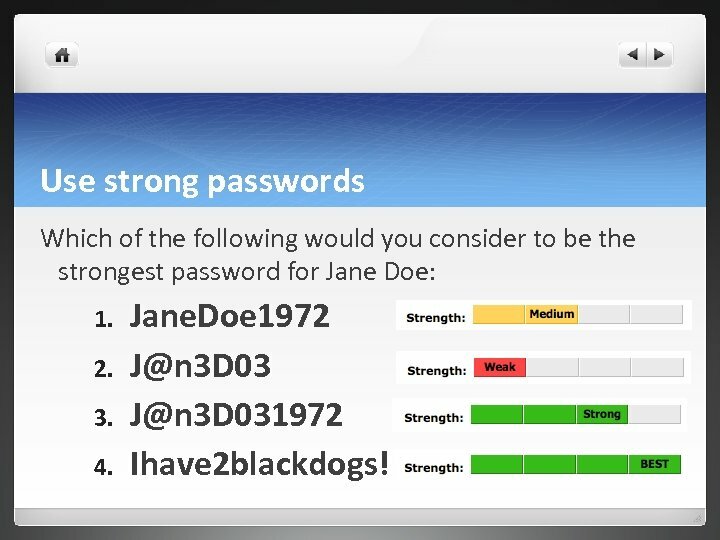 Use strong passwords Which of the following would you consider to be the strongest password for Jane Doe: 1. 2. 3. 4. Jane. Doe 1972 [email protected] 3 D 031972 Ihave 2 blackdogs! 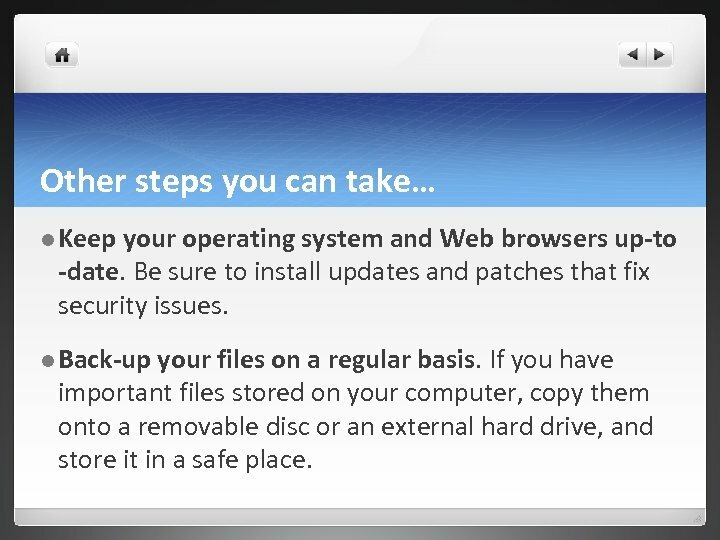 Other steps you can take… l Keep your operating system and Web browsers up-to -date. Be sure to install updates and patches that fix security issues. l Back-up your files on a regular basis. If you have important files stored on your computer, copy them onto a removable disc or an external hard drive, and store it in a safe place. Why should students be concerned? 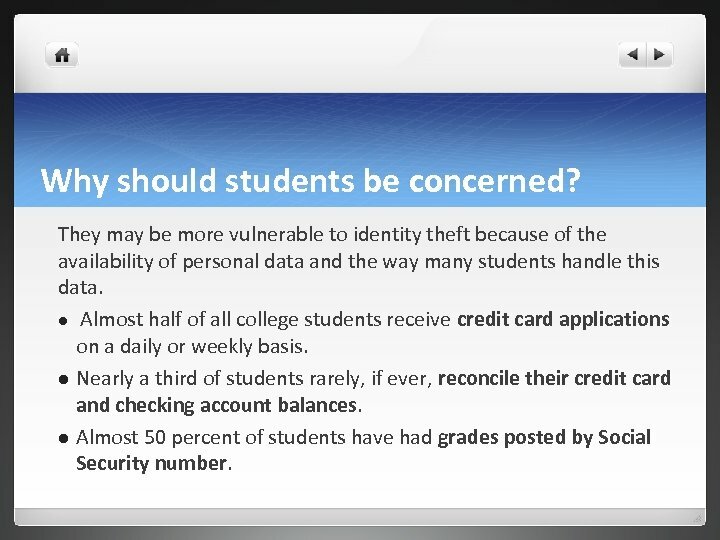 They may be more vulnerable to identity theft because of the availability of personal data and the way many students handle this data. l Almost half of all college students receive credit card applications on a daily or weekly basis. l Nearly a third of students rarely, if ever, reconcile their credit card and checking account balances. l Almost 50 percent of students have had grades posted by Social Security number. 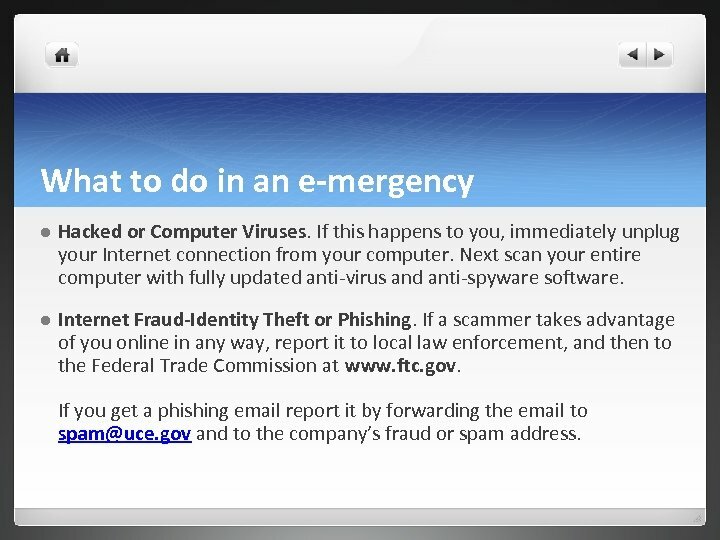 What to do in an e-mergency l Hacked or Computer Viruses. If this happens to you, immediately unplug your Internet connection from your computer. Next scan your entire computer with fully updated anti-virus and anti-spyware software. 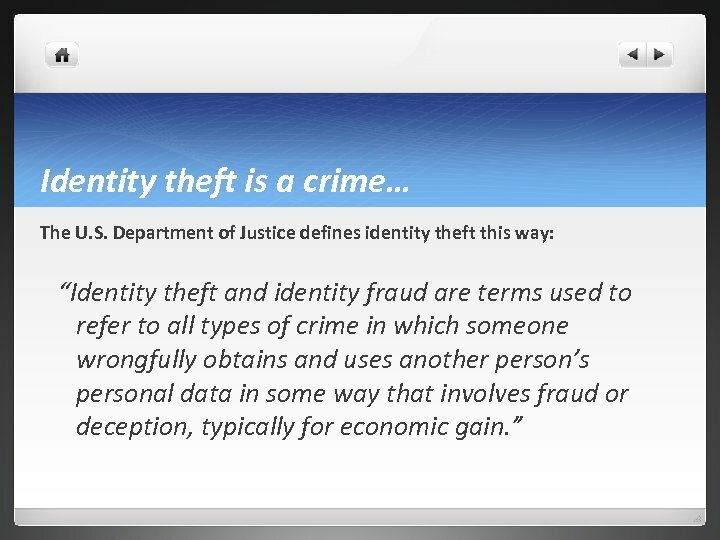 l Internet Fraud-Identity Theft or Phishing. If a scammer takes advantage of you online in any way, report it to local law enforcement, and then to the Federal Trade Commission at www. ftc. gov. If you get a phishing email report it by forwarding the email to [email protected] gov and to the company’s fraud or spam address. 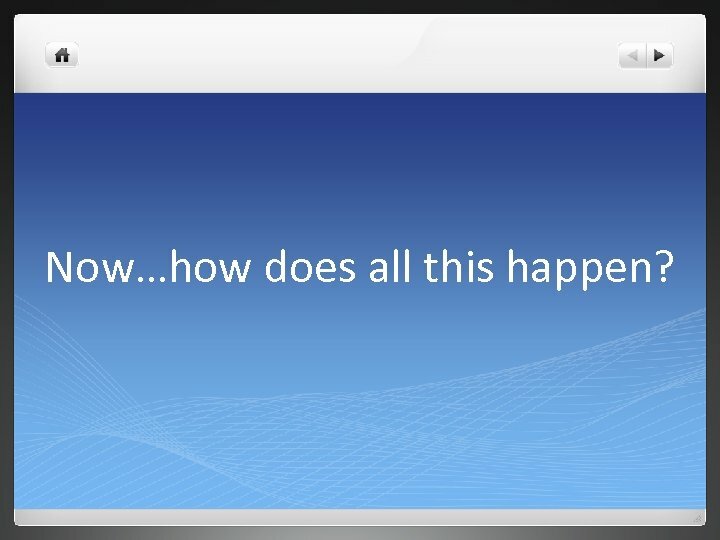 Now…how does all this happen?